Watch the trio -- along with Pat Smear -- tear through "Big Train" at Watt's Seattle gig. Punk icon Mike Watt performed in Seattle Wednesday night with his band the Missingmen – an under-the-radar gig at the intimate venue Triple Door. 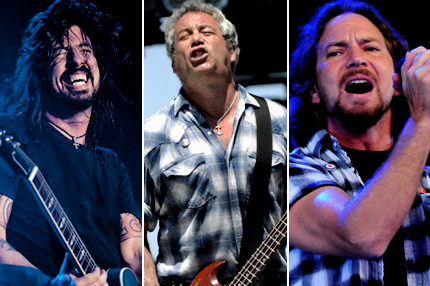 But the onetime bassist of the Minutemen surprised fans who paid $15 for a ticket when three grunge icons hopped onstage for an impromptu performance: Eddie Vedder, Dave Grohl, and Pat Smear. Watch video from the show (via via Seattle’s 107.7 The End) here. Watt – who once headlined a tour in 1995 with Vedder’s side-project Hovercraft and Grohl and Smear’s then-nascent Foo Fighters – invited the trio to run through a rendition of “Big Train,” from Watt’s ’94 debut album Ball-Hog or Tug Boat?, which feature guests spots from all three. Video footage is shot from a far angle, but the audio is clear. Best part: watching Grohl absolutely slay it on the kit, whipping his hair like his early days in Nirvana.